Every two years, Braskem’s headquarters settles at Feiplastic, the biggest event in the Latin American plastics sector. Design, architecture and brand experience were the foundations of the exhibition stand project, which featured the participation of multidisciplinary groups to propose innovative solutions that valued human relationships, transparency and proximity to the customers of the brand. We brought movement into the space by creating a screen wall, built with Braskem plastic, which explored infinite optical effects and allowed visitors to see different shapes and colors depending on their position. The contemporary, connected and angled architectural forms created a dynamic, interactive environment that brought people together. The exhibition was a success, with over 2,200 visitors who interacted with the exhibition in the five days of the event, generating over 25 spontaneous insertions in national and international media, in addition to reaching 2.4 million views on social networks. Proximity and innovation were the foundations of the communication that permeated the architecture, graphic pieces, and actions of the show. TRANSPARENT AND RECEPTIVE: transparent, barrier-free indoor areas. Contrast between the white of the furniture and the vivid colors of the communication. DIVISIONS: integration between internal and external spaces through a screen wall made of expanded PVC, which provided an infinity of optical effects, playing with the notion of space and time. INTIMIATE AND CREATIVE: the members of Braskem’s business team were the protagonists of the communication: photographs of the business team were used alongside inspiring phrases that spoke about the human relationship with customers. INNOVATIVE AND TECHNOLOGICAL: vibrant colors with the use of gradients integrated into the contemporary and angular architectural forms. In order to integrate the various teams involved in the process and ensure the unity of the concept and experience, a strategy was designed that guided the work all teams involved: research and diagnosis, creation of strategic pillars and communication for the show, support points, concepts and guidelines reflected in each point of contact, relationship events, and an experience map. From architecture and communication to the mapping of the visitors’ experience journey, display windows, videos, multimedia, etc., everything was designed to be integrated into the 1,813-square meter space, fully assembled within five days. 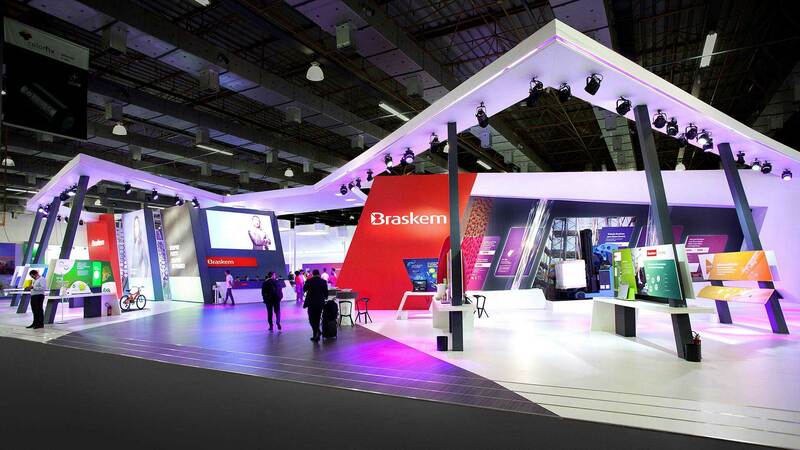 “Every two years, Braskem’s headquarters settles at the biggest event in the Latin American plastics sector,” commented Luciano Guidolin, then Vice President of Technology & Innovation and at the Brazilian and European Polymers Unit. The event is one of the company’s most important communication actions and integrates areas of institutional relations and strategic and commercial marketing. In the five days of the event, the booth welcome more than 2,200 visitors, obtained 25 spontaneous insertions in national and international media, and reached 2.4 million views and 37,817 interactions in the 37 official posts related to the event on Braskem’s social networks. A architecture and brand experience project that contributed to consolidate the innovative legacy of Braskem and share its solutions, beliefs and goals with society.